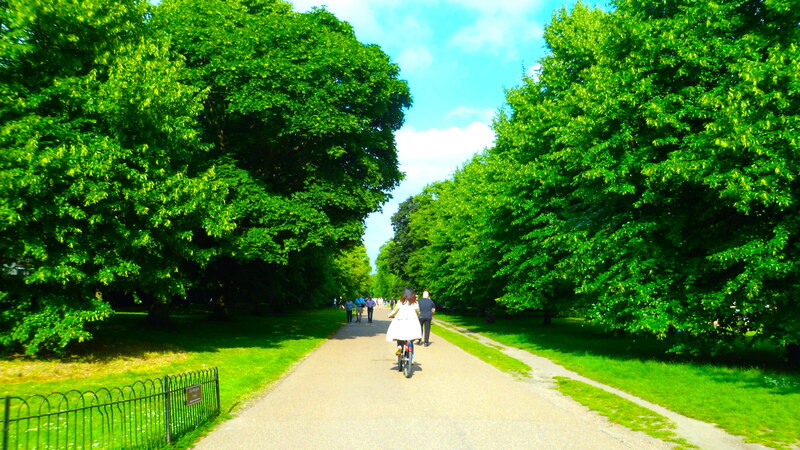 With just a few steps from Hyde Park, you’ll find yourself roaming around London’s Kensington Gardens, which used to be a deer park; yet even more sprawling masses of green space to soak up. Have a wander around Megan and Harry’s back yard, amongst the swans and tree lined pathways or sit amidst the squirrels (that will jump onto your bench, sit beside you, nearly knock over your bottle of water and stare you out – waiting for you to give them food. True story). London may have a lot to answer for when it comes to traffic, pollution, crowds, hustle and bustle – but it certainly compensates for some of that with parks like this – it’s absolutely massive, overwhelmingly green and a welcome resting place from the busy city streets. The squirrels are surprisingly bold, not scared of people and very conformable getting close to you! I couldn’t just walk past this and not take a picture…..share your best captions below!! He’s lying on top of where I buried my bone! Here’s John modelling our new range in belt buckles. Quick hurry wake up Mummy’s coming! You know I can’t sit on the grass! Someone get my owner a dentastick quick! Man down, I need back up Chief! There’s no way I’m sitting on that grass I’ll get my lovely white coat all dirty! When his owner said to sit by the chestnut …spot misheard and sat on the the chest and nuts! You are not making me walk on the pavement anymore in this blazing hot sun – I have burnt paws! Nope! It is not time for home yet. Stay put! Half price man sitting,…TODAY ONLY! This will let the dog catcher I have an owner. The new guide dog took his job very seriously! Loyalty – worth every dog hair! The fashion police had started using dogs to apprehend the most serious offenders. How many chest compressions did you say I have to do? Granddad didn’t quite understand the concept of dog sitting! Mate, I said I needed a chair, not a blanket! “Could you breath out a bit more I’m trying to see their picnic”!! I know you are feeling a bit ruff but I need to have a walk!!! This is a must see when I visit England.